You want to know something weird, and most likely not normal at all. I love Mondays. There is something about starting fresh for the week. Waking up, drinking my coffee, planning out my day...week. A new beginning, to make this week better, more productive then the last. Or here's to hoping! So hello Monday! You are looking glorious so far. 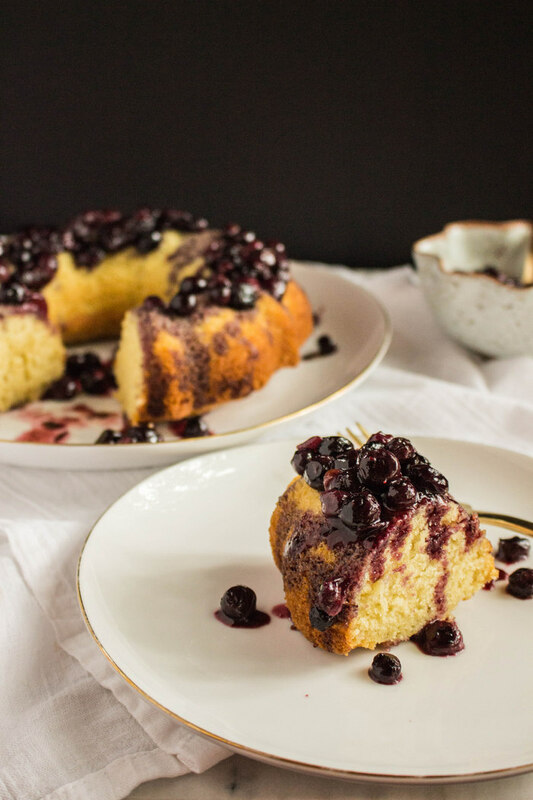 And with that I share with you my favorite Olive Oil Cake recipe topped with slow roasted balsamic blueberries. If you have some blueberries to spare, swirl them into your yogurt for breakfast. Or better yet, make a cocktail with them! Here are a few other recipes where I roasted fruit (roasting is my thing! )...Sage Roasted Plums with Balsamic & Red Wine, Roasted Strawberry Gin + Tonic, Roasted Tomatoes & Kalamata Olives. Preheat oven to 325 degrees. Oil large bundt pan and set aside. Whisk together flour, salt, baking powder, baking soda, and sugar in a large bowl. In a small bowl, whisk together olive oil, milk and eggs. Gradually pour the wet ingredients into the dry ingredients and fold together. Fill the bundt pan with batter and bake for 30-35 minutes until tester comes out clean. Allow cake to cool for 5-10 minutes on wire rack before inverting onto a plate. Line a rimmed baking sheet with parchment paper and place washed blueberries onto the pan. In a small bowl whisk together maple syrup, olive oil, and sea salt. Pour over the blueberries and toss together. Arrange the berries in a single layer and roast for 30 minutes. Remove from the oven and top with balsamic vinegar. Toss together and place in a small bowl to cool. Serve over olive oil cake.